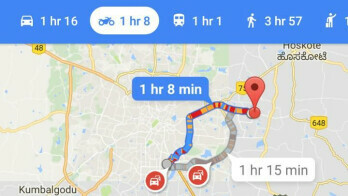 Google has started rolling out a new update to its Google map App which will make the app a lot more useful and also serve more people most especially motorcyclists. The new update will feature a new mode which is called the motorcycle navigation mode. With the new mode, motorcyclists will have access to riders routes which won't be available to drivers and also an ETA (estimated times of arrival), based on information collected from other riders, rather than car drivers. To use the motorcycle navigation option, all you need to do is to select the motorcycle icon from the mode of transportations located just below the search bar. This new feature has already started rolling out starting from India and it's expected to be available in all regions pretty soon.